Original Plate of "The Atlas to Accompany the Official Records of the Union and Confederate Armies, " Commissioned by Resolution of the U. 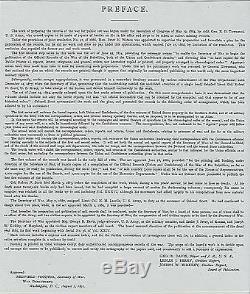 Congress of May 19, 1864 to Serve as the Official Historical Record of The Civil War, Illustrating in Intricate Detail the Battle Lines, Campaigns. Field Reports, Correspondence, Troop Positions, Coastal Surveys, Skirmishes, Naval Blockades, Military Strategy, and Topography During the War. 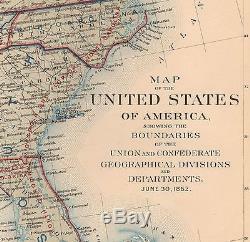 Of the 10,000 Published, Less than 1,000 Complete Atlases Remain. Fine Adornment of Civil War History. Impressive on Any Home or Office Wall. 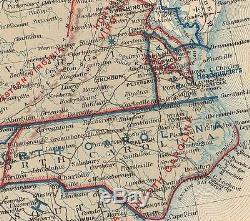 Map of The Union & Confederate Boundaries June 30, 1862 Showing the Boundaries of the Union & Confederate Geographical Divisions & Departments, June 30, 1862. Original Plate CLXV (#165) of the 175 Lithograph Plates of The Official Atlas to Accompany the Official Records of the Union and Confederate Armies, Commissioned by Resolution of Congress, Published in 35 Parts of 5 Plates Each, Entered into The Library of Congress, and Dedicated to Preserving the Historical Record of The Civil War, Containing a Wealth of Knowledge and Information on Troop Positions, Battle Lines , Field Reports, Correspondence, Coastal Surveys, Skirmishes, Naval Battles, Military Strategy, and Topography During the Four Years of the War - The Undertaking of Accumulating Records and Assembling The Atlas Taking Over 30 Years to Complete. Original Plate CLXV (#165) of the 175 Published. Map is in Very Good/Good condition. No soiling, marks, or writings. Closed separation along fold indentation previously repaired. 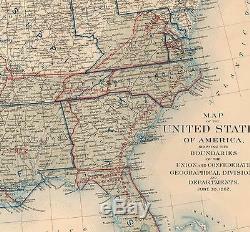 Original Lithograph Engraved by Julius Bien for the The Atlas to Accompany the Official Records of the Union and Confederate Armies, Commissioned by the Resolution of Congress of May 19, 1864 in Accordance to Serve as The Official Historical Record of the War. 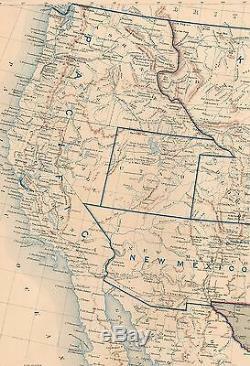 The Atlas Entered the Public Domain when withdrawn from Libraries and Other Federal Depositories over the Past Century. Impressive On Any Home or Office Wall Dimensions: 19 " x 29.5" Fine Adornment of Civil War History. Great for History and Family Genealogy, as Map Shows Cities, Towns, & Landmarks during the War; Some of Which No Longer Exist Today. 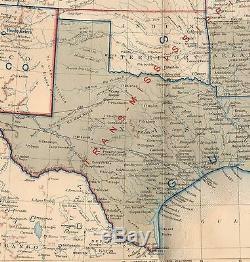 Shows Cities, Towns, Mills, Forts, Pony Express Route, Indian Territory, Railroads, & Many Other Landmarks. 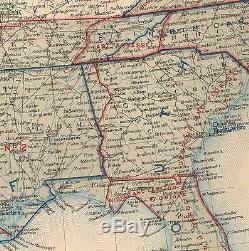 A Few of the Cities, Towns, and Landmarks located on the Map Include: Atlanta, Georgia; Charleston, South Carolina; Richmond, Virginia; West Division; East Tennessee; Union Headquarters, Texas; Pony Express U. Joseph, Marion, Fort Worth, Henderson, Elberton, Americus, Dahlonega, Greenville, Millen, Edgefield, Jacksonville, Lincolnton, Bolivar, Little Rock, Hot Springs, Webster's Mills, West End, Fairview, Lavansville, Rocky Springs, Winchester, Cumberland, Old Town, Frankfurt, Piedmont, Swanton, Stephensburg Newtown, White Point, Charlestown, Towson, Broadlandville, Owen's Mills, Sykesville, Gettysburg, Hagerstown, Clay, Marion, Manasas Gap Railroad, Orange and North Atlantic Railroad, Washington DC, Alexandria, Proposed RailRoad LIne, Fairfax Court House, Warren, Hampstead, Parkton, Barnesville, Harper's Ferry, Loudoun and Hampshire Railroad, Rockville, Baltimore, Philadelphia, Harrisburg, Lebanon Valley Railroad, Hanover Junction, Chambersburg, Charlesville, Hereford, Ashland, Hilton, Poplar Springs, Mechanicsville, Leesborough, Upper Marlboro, White Plains, Battletown, White Hall, Watson, Meeting House, Woodstock, Annapolis, Elk Ridge Railroad, Warrenton, Flint Hill, Jefferson, Fayetteville, Woodville, Port Tobacco, Sykesville, Porter's Store, New Windsor, Bel Air, Fireland, Glen Rock, Shrewsberry, Chambersburg, Chester, Wilmington, Beverly, Norristown, Valley Store, Fort Gates, Harrisonburg, Brandon, Raleigh, Monticello, New Orleans, Houston, and many others. 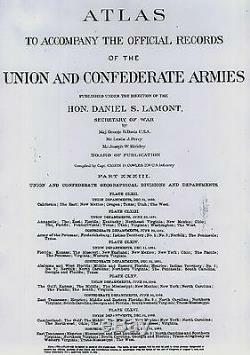 The Atlas to Accompany The Official Records of the Union and Confederate Armies was Commissioned with the Resolution of the U. 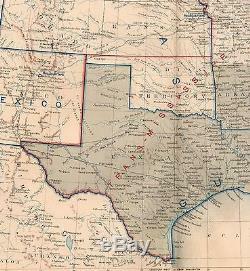 Congress of 1864, by which Adjt. Townsend was Appointed Directorship of the Collection and Preparation of the Atlas, which was ultimately Completed and Published in 35 Parts in Sets of Five Lithographic Plates by the U. Dedicated to Preserving the Historical Record of the War, the 175 Lithographic Maps Portray a wealth of Knowledge and Information on Division, Corps, and Troop Positions; Battle Lines, Military Strategy, Topography, and History. Greetings from Historical Savannah, Georgia: Founded 1733. Some, to beautify their halls, chambers, and studies... Loveth, getteth, and useth maps, charts, and geographical globes. John Dee, Advisor to Queen Elizabeth I. 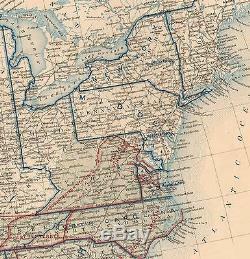 The item "Original Antique Civil War Map UNION & CONFEDERATE BOUNDARIES June 30, 1862" is in sale since Saturday, December 23, 2017. 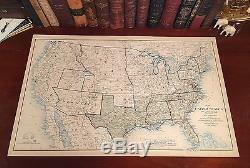 This item is in the category "Antiques\Maps, Atlases & Globes\North America Maps". The seller is "jonesjackson" and is located in Savannah, Georgia.